Celtic Symbolism: The Celtic Hounds "Bran and Sceolan"
As i commented on a previous post, it is very common to find on Irish and Welsh medieval literature references to courageous warriors and brave dogs respected by their loyalty, and often given as a gift to them. Many argue Celtic hounds to be either the Greyhound, Scottish Deerhound, Irish Wolfhound or even a mix of all these breeds. A very particular case is the one related to the The Fionn Cycle , also known as the Fenian Cycle–for Fionn‘s warrior band, the Fianna–the “Fionn Cycle” traces the exploits of Fionn mac Cumhaill, the wandering, woodland warrior of Irish myth. They were popular in both Ireland and Scotland, each country producing numerous narratives and poems on the subject. Fionn may have originally been a sort of zoomorphic god, a type of Cernunnos, the deer-horned god in Gaul. 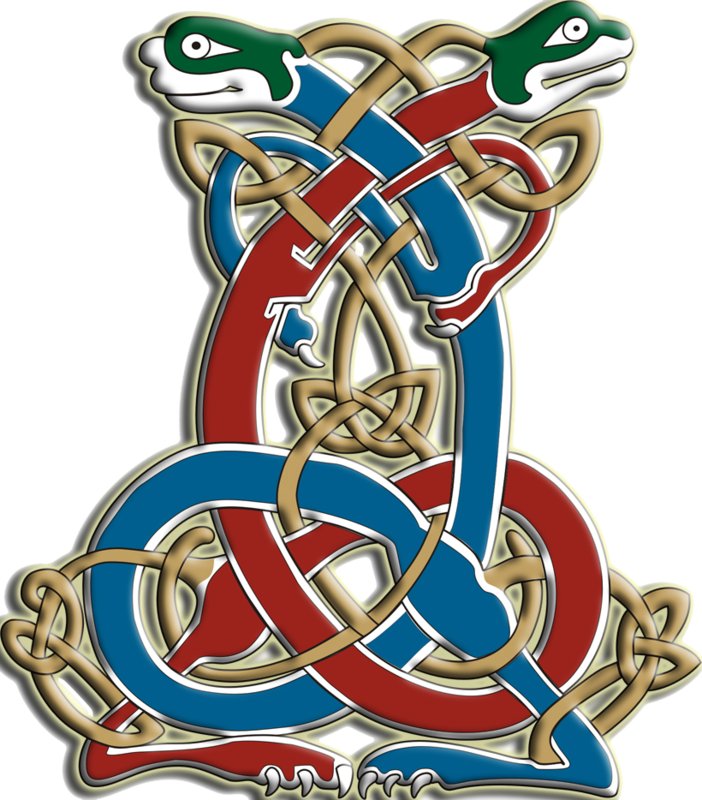 Moreover, it is Fionn who contributes important elements of Celtic belief in wisdom through his eating of the salmon of wisdom, and it’s related theme of imbas forosnai. Moreover the mother of Bran and Sceolan was Tuiren, and was Fionn Mac Cumhaill’s aunt, transformed into a hound by a fairy. Fionn met his most famous wife, Sadhbh, when he was out hunting. She had been turned into a deer by a druid, Fear Doirich, for she had refused to marry him. Fionn’s hounds, “Bran” and “Sceolan” (Sceolan, pronounced Sky-O-Lawn or Ska-Lawn), who were once human themselves, recognised she was human, and Fionn spared her. She transformed back into a beautiful woman the moment she set foot on Fionn’s land, as this was the one place she could regain her true form. She and Fionn married and she was soon pregnant. 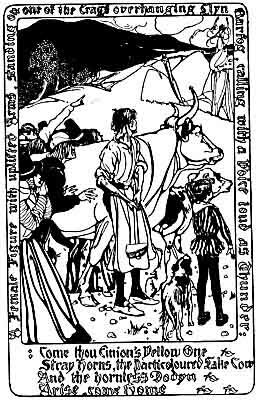 However, Fear Doirich (literally meaning Dark Man) returned and turned her back into a deer, whereupon she vanished. Fionn spent seven years searching for her, but to no avail. Fortunately, he was later reunited with their son, Oisín, who went on to be one of the greatest of the Fianna. It is usually assumed that Bran and Sceolan were Irish Wolfhounds, since this breed was used to hunt Wolves and Deer, but they were also used as war dogs to attack men on horseback and knock them from their saddles to be killed by others. Bran and Sceolan are monstrous dogs, wonby Finn from a kind of Celtic version of the monster Grendel inBEOWULF, who had been stealing babies from a young champion’shouse. Like their mother, they are gifted hunters with a strange mixtureof colours and great savagery in other versions. These narratives can be found in both Ancient Irish Tales, translated by Cross & Slover, and Old Celtic Romances translated by P.W. Joyce. Aside from these narrative tales, there were also poems annonymously composed and put in the names of several characters; it was translated as Duanaire Finn–The Lays of Finn in two volumes: the first in 1908 by Eion Mac Neill, and the second in 1933 by Gerard Murphy. These poems are taken from a single manuscript written in about 1626, but drawing on older material. and a fresh crimsonshining tail. stretching from histail to the end of his back. He had a fierce eyein his shaky head. It was impossible tocontend with him. Beautiful and lovelywas his fame. He was swifter thanall hare-hounds. was as high as myshoulder. This is a time for Divination. In the calendar system we have provided as an example, this moon is typically named the Candle Moon. this name refers to the light of the candles which (in many traditions) serve as a representation of the celebrations of Imbolc, Candlemas, The Festival of Lights, and Brigantia, to name but a few of the many fire festivals celebrated on or around February 2nd to celebrate and encourage the return of the sun and with it, the renewal of hope. In the Celtic Tree Calendar the name of this moon is Luis (Rowan) which runs from January 21st to February 17th. The Runic Calendar of Nordic traditions, (which is governed by half months rather than full months), divides this moon of the year by Sigel (sun) from February 12 through February 26th, and Tyr (Cosmic Pillar) from February 27th through March 13th. 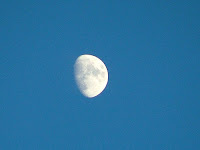 The Goddess Calendar names this moon of the year after Bridghit and runs from January 23rd through February 19th. The American Backwoods Calendar refers to this moon of the year as the Snow Moon and is determined by whichever full moon falls in February. This is a time for awakening. This is the time when the slow energy of the winter quickens and our thoughts turn towards beginnings… The beginning of the thaw… the beginning of a new cycle of growth… the beginning of that which is to come after the prolonged rest of the winter darkness. In history this moon brings the fever of love and is named after the Roman goddess Juno Februa, patroness of the passion of love. To this day February 14th is celebrated as a day of love and dedication throughout much of the world. Whether you know this as the Sap Moon, Rowan Moon, Candle Moon, or the Worm Moon, you know the best use of this newly awakened energy is purification and preparation for the rebirth promised in the noticeable lengthening of the days. However this moon is named, it speaks to the rituals of purification and preparation for the return of the sun. Today these rituals of purification and preparation are reflected in traditions of “Spring cleaning” the self denial of the lenten season, and even the lighthearted prognostication of “groundhog day”, all of which are aimed at planning for future growth and fertility through present preparation. So, with all that information to guide you, think of this moon as the perfect opportunity to prepare the path you would like to follow for the rest of your own personal year and observe it with the things that represent a dedication, (or a re-dedication), to your chosen path. If you select a personal name for this moon, this name too, should correspond to whatever reflects re-dedication to your chosen path for you. The beginning of that-which-is-to-come after the prolonged rest of the winter darkness. These celebrations have different names like Imbolc, or Candlemas, or Lupercalia, but they share a purpose. They are a reminder of the first seed of springtide as the Lord of the Forest walks the land to awaken the sleeping plants and animals with an acorn wand. Whether you know this as the Snow Moon, the Rowan Moon, the Candle Moon, or the Horning Moon, you know the best use of this newly awakened energy is purification and preparation for the rebirth promised in the noticeable lengthening of the days. This is what I’m saying SweetPea… it’s like the whole universe has just yawned and stretched and rubbed her eyes to a brand new morning. What do you usually do with a morning? Wake up, wash up, and wind up to start the whole rest of the day. Let them run through your fingers like glittering gems while you decide which ones are ready for revival. When you have the ones that offer the biggest and brightest promise for this cycle of regeneration and renewal, haul them out to a place of prominence in your future plans and take the next step, (whatever it may be…), toward achieving these hopes and dreams. Maybe you will need to make a call for more information. Maybe you will need to seek out advice and guidance from others. Maybe you only need to acknowledge their importance by elevating them from dreams to goals. Whatever that “next step” actually is… this is a great time to actually take it. As I commented on a previous post, Y Gododdin has a claim to be one of the earliest Welsh poems (or sequence of poems). 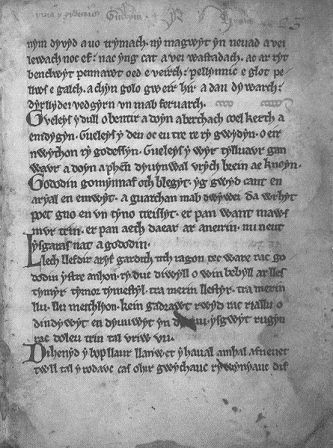 “Dinogad’s Smock” is a 6th century nursery rhyme written down in the margin of this old manuscript of Y Gododdin which is preserved in the thirteenth century, “Llyfr Aneirin” (Book of Aneirin), it contains one reference to Arthur, which may or may not be a later interpolation; if it is original it is the earliest of all references to our King Arthur. It is written in Cymraeg (Welsh) spoken in Cumbria until the twelfth century . During the ‘Heroic Age’, much of the treasure of Welsh poetry was written in Cumbria and Strathclyde. O grwyn balaod ban wraith. Mal ban lladd llew llywiwg. Pen pysg o Rhaeadr Derwennydd. Nid angai oll ni fai oradain. It was from marten’s skins that I made it. I would sing, eight slaves sang. As a lion kills its prey. A fish from Rhaeadr Derwennydd. None escaped which was not winged. I share with you this fine article as previously published on the partner blog “Esmeralda’s Cumbrian History & Folklore“ and written by Diane McIlmoyle. Re-posted under her kind permission. All rights reserved by the author. About 1400 years ago, a Cumbrian mother sang a song to her new baby, a boy called Dinogad. So our baby boy is wrapped in pine marten furs; perhaps he was born on a cold, wintry day like today. The poem goes on to describe how Dinogad’s daddy went out with his dogs, Giff and Gaff, to catch fish, deer, boar and grouse, presumably to provide a very rich dinner for a very large household. The poem, known as Dinogad’s Smock, could easily have been lost to history. It’s found scribbled in the middle of a rather serious and dramatic work known as Y Gododdin, which is a series of elegies mourning a whole generation of eastern Scottish warriors lost in a battle some time between c.570 and 600CE. 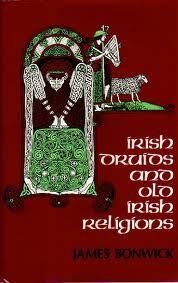 Scholars can tell by the way it’s written that it’s not meant to be part of the Gododdin story. It seems that Dinogad’s Smock was a popular rhyme probably scrawled in the margin of a very old manuscript of Y Gododdin, and it found its way into the body text by accident when the whole thing was copied years later. There’s a lot of debate about the exact date of Y Gododdin, and hence Dinogad’s Smock, but the general opinion is that Y Gododdin was composed by the bard, Aneirin, at about the time of the disastrous battle in c. 570-600CE. They were probably originally sung rather than read, because few people could read, and the music helped people commit it to memory. As literacy spread in the following centuries, these old songs were written down and the popular ones were updated each time someone made a copy. But some old-fashioned phrases and words were kept as they were part of the character of the piece – think about the Temptations’ My Girl and The Drifters’ Sweets for my Sweet. Now, if any modern girl was called any of those things we’d laugh our way into next week, but they date the composition of these songs firmly to the 1960s. In a similar way, scholars have decided that Dinogad’s Smock probably really is 1400 years old2. Locating Dinogad’s Smock to Cumbria took a long time. The earliest Book Of Aneirin is kept in Cardiff Library, which is hardly surprising given that it’s written in Welsh. But, of course, Welsh wasn’t a language restricted to one corner of Britain 1400 years ago: we all spoke our own variant of it. The link to Cumbria is the mention of the Rhaeadr Derwennydd, or Derwent waterfall. There are about ten river names in Britain derived from the same root (it just means water flowing through an oak wood), including four that are actually called Derwent, in Cumbria, Derbyshire, Northumberland and Yorkshire. The give-away in the end was a survey completed by a resourceful academic3 who established by the simple expedient of writing to all the country’s water authorities that the only Derwent that has a waterfall is the Cumbrian one. The Derwent’s waterfall is now famous to tourists worldwide as the Lodore Falls, which still crash picturesquely through woodland just south of the lake of Derwentwater, at the head of Borrowdale. Up the slope from the Lodore Falls is a wooded area known as Hogs’ Earth – is this the place that Dinogad’s daddy went hunting for boar? – and above that, a hill called Castle Crag. This part of the central Lake District is thinly populated now with barely a tea room or country pub to interrupt the view, but it has always been inhabited. The Lodore Falls are at the foot of Ashness Fell, which is next door to Castlerigg fell, site of a very famous and very beautiful neolithic stone circle. 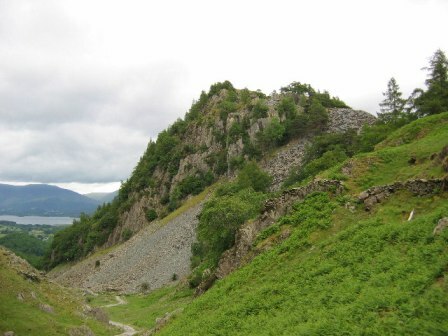 Castle Crag’s name isn’t just a romantic fancy, either – there is archaeological evidence of settlement from the iron age and post Roman period. That’s Dinogad’s time, and it’s not entirely bonkers to suggest that this is where Dinogad, his singing mother and his hunting father, looked after a significant part of the centre of Rheged. The final irony of Dinogad’s lullaby ending up in Y Gododdin is that recent opinion4 suggests that the Scottish Gododdin people were fighting not the north-eastern Angles, as was thought for years, but an alliance of their fellow Britons led by Urien of Rheged. That would mean that Dinogad’s daddy was, in fact, one of the warriors on the winning side of the slaughter of the Gododdin in that dreadful 6th century battle. Special note: My thanks to Tim Clarkson, author of The Men of the North, a book on this period and area, for drawing my attention to Dinogad’s Smock. Tim is kind enough to take an interest in this blog and thought my Cumbrian readers would like to hear about baby Dinogad; he provided many of the sources for background and analysis. Tim remains undecided as to whether Rheged really is Cumbria, but supports the identification of the Derwent waterfall with the Lodore in Cumbria. He points out that, given the ongoing uncertainty about the identification of Rheged as Cumbria (and hence of Taliesin’s work with Cumbria), Dinogad’s Smock is the earliest certain Cumbrian poem. That’s quite grand for that 6th century baby, isn’t it? See p117 of A. Conran’s Welsh Verse (1986). As copyright applies to translation, I’m struggling to find a version that I can produce in full for you. Tony Conran’s is the most obviously poetic, but a more scholarly translation can be found in AOH Jarman’s Aneirin: Y Gododdin (Llandysul: Gomer Press), pp68-9. See discussions in John Koch, The Gododdin on Aneirin: Text and Context from Dark Age North Britain (1997). Kenneth Jackson, Language and history in early Britain (1953), AOH Jarman, Aneirin: Y Gododdin (1988). R. Geraint Gruffydd (1990), ‘Where was Rhaeadr Derwennydd (Canu Aneirin, Line 1114)?‘, pp 261-6 in ATE Matonis and Daniel F Melia (eds), Celtic Language, Celtic Culture: a Festschrift for Eric P Hamp (Van Nuys, Californita: Ford & Bailie). John Koch, The Gododdin on Aneirin: Text and Context from Dark Age North Britain (1997).